I guess I really didnt set out to make a "fun gun", but turns out that's the best term for what I ended up with. I just wanted a narrow longboard with a pulled in shortboard type nose. Which is pretty much what a fun gun is. 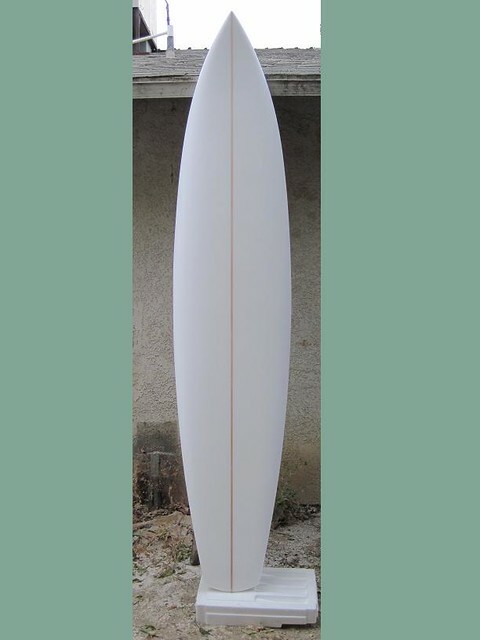 I also wanted something really thick, so I got a US Blanks 9-3A from Fiberglass Hawaii in Ventura, Steve Huerta is my go-to guy there, always friendly and helpful. I went with blue density, the red is just a bit too soft for my tastes, compresses too easily, so this is my first try with blue. I think the "classic" is a bit too heavy, but maybe not. I have a classic foam board I haven't quite finished, have to see how it ends up. The blue density is a pleasure to work with, shapes up so sweet and easy. I drew up some sketches of what I wanted, then made my spin template off my sketches. Cut my blank a little oversize, and shaped up to the rail bands, then cleaned up the outline and finished shaping. The graphic plan for this one (subject to change at any time) is an old sign theme, like someone had taken the board, and made a sign out of it. 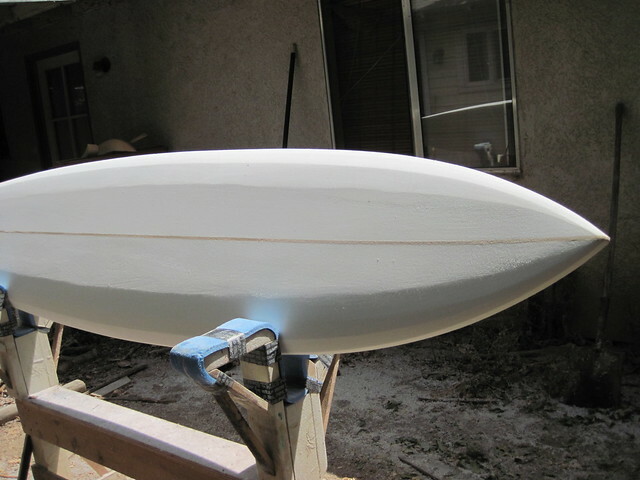 So I may try to "yellow" the foam a bit before glassing, to give it that old surfboard look. Any suggestions on that are welcome. 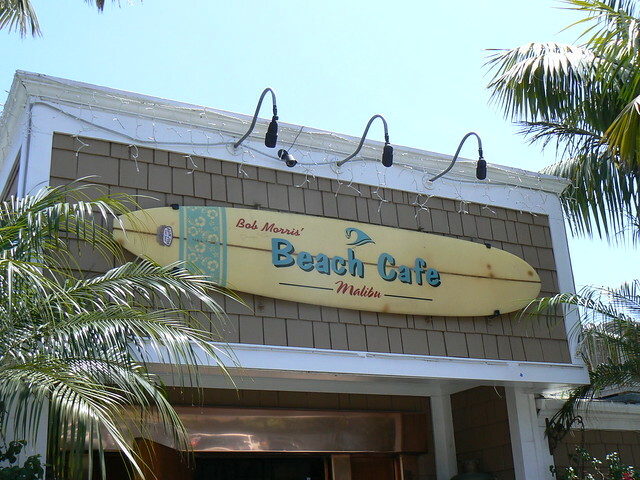 Then I'll paint it, like it was used as a bar & grill sign. Just cuz I like the look of signs that are painted on a surfboard, and I think signpainters, like hand-shapers, are kind of an endangered species, so this is sort of a tribute to them. 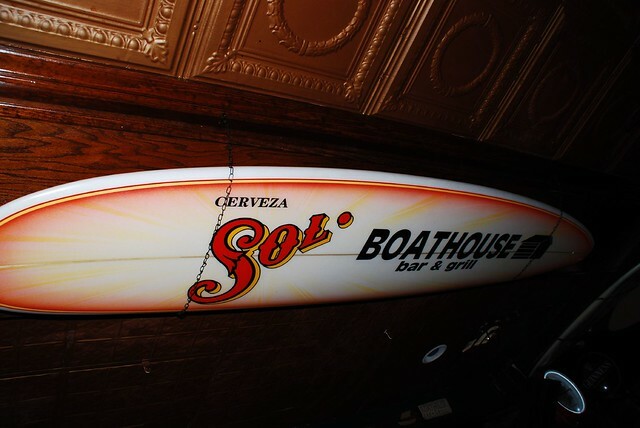 Plan on going quad on this, probably with a single-fin box in the middle, so it could also be a single or single with side-bites. Again, subject to change, but thats where my thinking is at this point. The 9-3A is a monster blank, they actually make an "X" model too, but the standard blank is fat fat fat. That's what I wanted. This baby, shaped out, is 4" thick! You really have to think about your rails and foil when you have that much foam in the middle, to taper it all out as gracefully as possible. As always, I skin with a power planer, and shape with surform and sandpaper. I have a lot of respect for the approach you use in building and applying your artwork. I still handpaint logo's and other artwork on boards. Some of my customers tell me I should have one of those printing companies print me a lam or a fabric cloth inlay. I just tell them I enjoy it. They often ask me why I do it the hard way. I simply tell them, because I can. Keep doing your thing Huck! Considering the fact, you let me fondle Carmen, you can shape VERY well, and I understand no rush, hand tools and skill. Is that where you shape the babes? No lights??? I mean I’ve done it, way back when, ah with my trusty tool which pissed my old neighbors off no end. Funny 2 me since joining on here at Sway’s I have been trying to slow down between BT and “other old timers” I’m trying but so hard to just end prior to killing’ a step and walkin’ away, tuff. It’ll be a wave catching magnet. Functional template a little late but could use tweaking, ha is US public? I’ll buy stock. Obviously you want to get waves, ah forgive me but your theme is all wrong. How’s this, a little more intimating. "Doghouse" it is where us olde timers still wind up, when the "old lady" smells new foam! Thanks Barry! That's awesome about the handpainted artwork, I agree, because we can. We were given these hands for more than just running a keyboard and a mouse! To me, board making is one of those things I don't like to rush (kinda like that other thing you don't wanna rush, or use a machine to do, cuz its just too doggone fun). As it is, I might take some heat for doing the bulk of my shaping without power tools, but it still goes pretty fast, a few hours and its all over but the fine tuning. Hey Matt-who Steve told me you were just in spending hard earned cash, so I hope you have some more pics coming up (did he tell you about the great white off Mugu, and a thousand pound bull seal with half its body gone from one big bite?) Yeah, I'll buy stock too, when I win the lottery. Which I don't play, so scratch that, haha. But shaping is like the mafia, once you're in, no getting out...or something like that! You can tell me your tweak suggestions, and if they're compelling enough, I'll go buy another blank, finances permitting. Like you, don't know how much longer I can keep paddling out, (doesn't get any easier, does it), so we just got to keep going while we still got a little momentum! Which reminds me, how we gonna get Steve back out in the lineup? BTW I did get an 8-2A also, so if your suggestions apply to that fat little puppy, speak up, don't wait til I shape it then tell me "oh yeah, kinda late now", lol. That one's probably gonna be my Rusty Big Cat - type model, or a bigger version of this (yes, there is a board - a Stewart quad, in that pic, if you look hard enough!) https://flic.kr/p/nXPWnd. Nah, I'm no good at intimidating anybody. I just keep cheating on volume, works for me so far. On the 8-2 BTW X? Ya know Steve and Barry are two rare guys, honest as the day is long and Ohana 1st. Yeah picked up 2 "orange" short ones. cutting 'em up right now (more glue lines w/ a twist). Think more interest would be shown as a step by step build tread? And we are going to have to drag Steve into the water! together I think we can do it and Louie will help! Hi mattwho the 8-2A I got isn't the X model, but it's thick enough! I used it on the banana boat, which finished up at 3 5/8" thick. Check your pm's for more. i shape about half and half backyard and shed, when light is good backyard is better cuz I just leave the dust I make, but man my yard needs some TLC... One of these days. i really want to try to get Steve back in the water, I am so grateful for the two brothers who did it for me 5 years ago, after 23 years away. The older you get, the less likely it becomes you'll ever get back out there. i am pretty stoked on this board, have no idea how its gonna ride, it's not like anything I've ever ridden. I seem to remember "razor thin" HP longboards. This is a far cry!